The fog which we experienced yesterday evening was still in evidence today, even in the Old Market Square at lunchtime. I met up with my workmate who is a photographer too, as he wanted to have a go with my 40-150mm, f2.8 lens. He has just converted to Olympus from Fuji, and wanted to try my lenses out, to see if they would suit his style of photography. So while he was having a go with that, I was using another lens. 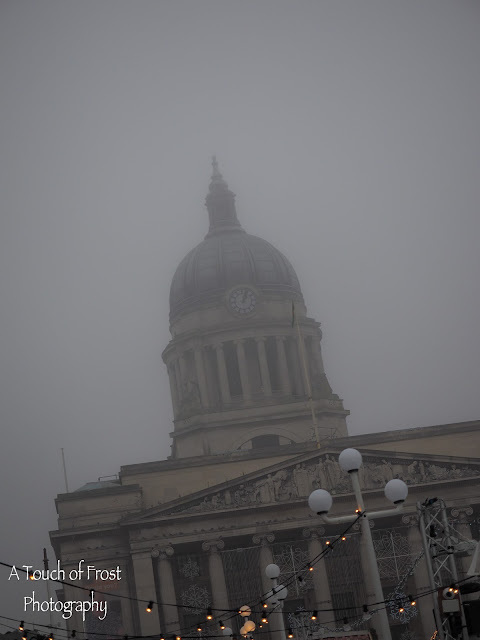 So decided to take a photo of the Council House, which was bathed in grey. Apparently tomorrow's weather should be a lot better, so we'll see what what is on offer for our cameras.